The audience was K-6 educators from a variety of educational settings. I don’t mention this very often on this blog, but I actually am a teacher! I co-teach in a combined first and second grade at the Common School in Amherst, MA, where I’ve been working since 2004. Most of the time, I am in the classroom doing all the usual academic things: reading, writing, word study, math, science, social studies, arts and crafts. I do fiber and dye projects with kids when I can, and the rest of the time I squeeze it in on weekends and vacations. Back to the conference: My time-frame was 2:15-3:45 in the afternoon. This is a normal amount of time for most workshops at a day-long conference like this, even hands-on workshops. The only trouble is that all the steps in natural dyeing take a long time. 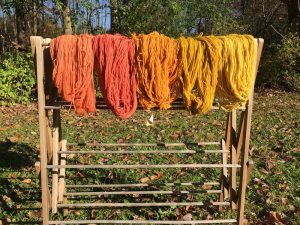 If you want to make a dye bath with fresh, frozen, or dried plant material it takes at least 45 minutes to an hour, and then in an ideal world you let that sit overnight. 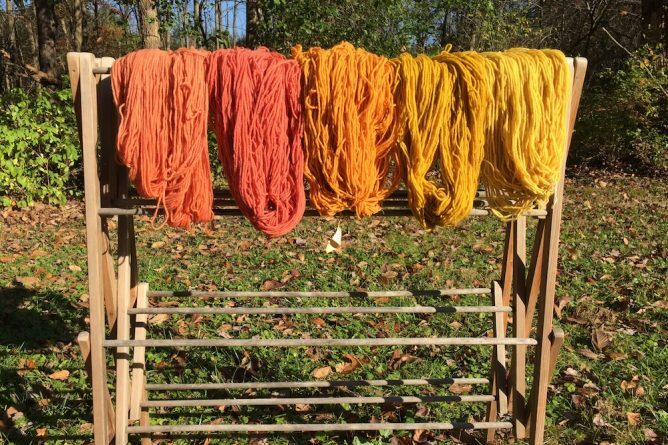 Dyeing the skeins of yarn takes the same length of time. I always let the skeins or fiber sit overnight if I can, and I let them dry before I rinse them. Also, you have to mordant the fiber ahead of time. You cannot possibly fit it all in to an hour and a half. Nevertheless, I had committed to teach this thing. Making color with plants is so magical and so do-able that I am always happy to encourage people to try it. We were literally putting in the last skein of yarn at 3:45! True to its name, we were outside for part of the workshop, and inside for part of it. When I set up in the morning, the outdoor space was shady and pleasant. A helpful custodian helped me run two long extension cords out of two windows, down to the ground on the playground below. There, I set up two portable electric burners. I set up everything we would need for dyeing outdoors, I set up books, hand-outs, and project samples in the classroom, and then headed off to enjoy the rest of the conference. By 2:15, the sun had come around to our side of the building and it was blazingly hot. You wouldn’t have anticipated a blazingly hot day in late October, perhaps, but such it was. I think it was about 80 degrees. I had a great group of participants, about 20 folks, who obligingly tolerated the blazing heat for a few minutes while we got started. But it was really uncomfortable! I was feeling bad about it, but also feeling kind of stuck and unsure of what to do. Then, someone pointed out that it was shady just around the corner of the building. Yay! We moved things around the corner, and Ellen Doris (a former colleague at the Common School and my contact for the conference) brought an extra extension cord. We all breathed a sigh of relief in the small patch of shade behind a wall, and proceeded to set up the dye baths. 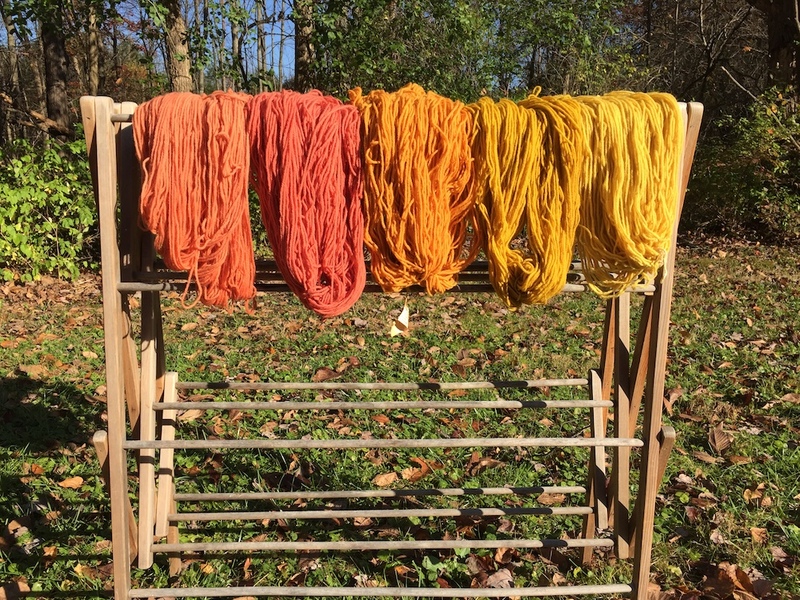 We used four dyes for this workshop: madder, weld, orange cosmos, and marigolds. In my next post I will go into all the details of exactly how we obtained these colors!